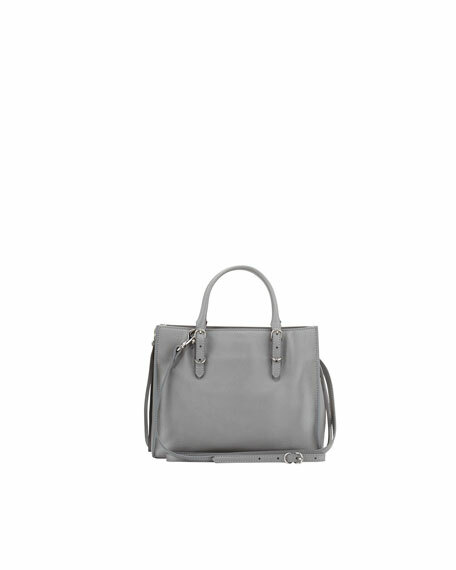 This streamlined Balenciaga Papier A4 Leather Tote conveys ease and refinement with supple leather. Gray calfskin with palladium-finish hardware, including stud and buckle detail. Removable shoulder strap; 21 1/2" drop. Thin, buckled top handles; 2 3/4" drop. Open top with magnet closure. Interior slip pocket and Balenciaga embossed leather tag. 7"H x 8 3/4"W x 3 3/4"D.
Bag weighs approx. 1lb. 8oz. For in-store inquiries, use sku #146016.